With an impressive assortment of slick new features, LG’s newest Smart Refrigerator monitors food freshness, suggests recipes, creates shopping lists and more. By scanning a grocery receipt or individual product barcode via smartphone, users can track the freshness of all the items in the fridge. The LCD touchscreen panel and voice recognition can also be used to enter food items and their expiration dates. Once all items are entered, the appliance can even recommend recipes based on ingredients available. 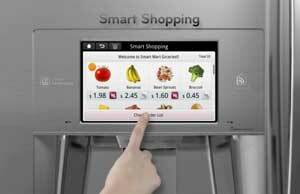 The fridge also boasts a feature LG calls “Smart Shopping,” that allows consumers to shop directly from the LCD panel. Shopping lists can be created directly from the inventory. By simply pressing a “Go Shopping” button, and the list will appear on the panel or users smartphone. The Smart Refrigerator create menus based on personal profiles that account for age, gender, weight, Body Mass Index and other health factors. You can even create weekly meal plans that fit custom factors. Lastly, the fridge will alert you via smartphone if, for instance, the door’s ajar or ice maker’s been left on. If the Smart Fridge is on the blink, you can also send diagnostic information directly to service centers and remotely check on inventory if you’re at the store. Of course, if you want to use the screen to view digital photos, make calendars and to-do lists, and record voice-memos, that’s all there, too. They included everything but the, er, kitchen sink.